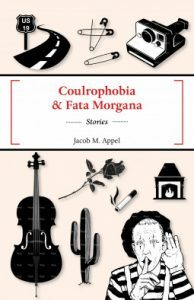 I won a signed copy of Coulrophobia & Fata Morgana, by Jacob M. Appel, through LIbraryThing. This is a collection of short stories and I’m on record several times as stating that I’m not a big fan of short stories, because I rarely find them satisfying. But if I’m going to read them I prefer to get my hands on a collection like this one. It gives me more of a feeling for the author than a mere 20 page snippet alone. And I liked Appel’s writing. I found the stories thoughtful and meaningful, which in a lot of circumstances is my biggest complaint about shorts. I don’t feel the accomplish anything by their end. Not here, I ended this book happy to have read it and each story in it. A man recently told me I don’t review short stories properly, inferring that I’m reading them incorrectly. And I suppose if you expect me to be able and/or willing to go on at length about this being an example of the X type of story or the Y narrative format, I’d have to reluctantly swallow my allegation of mansplaining and concede the point. But I rather read and review shorts based on the simple maxim that I must enjoy them, regardless or how or why. I enjoyed Appel’s stories. It doesn’t matter to me why. That is enough. I easily recommend this book to those looking for a collection of easily digestible short stories. This entry was posted in books/book review and tagged book review, short story collection, won on May 21, 2017 by Sadie.